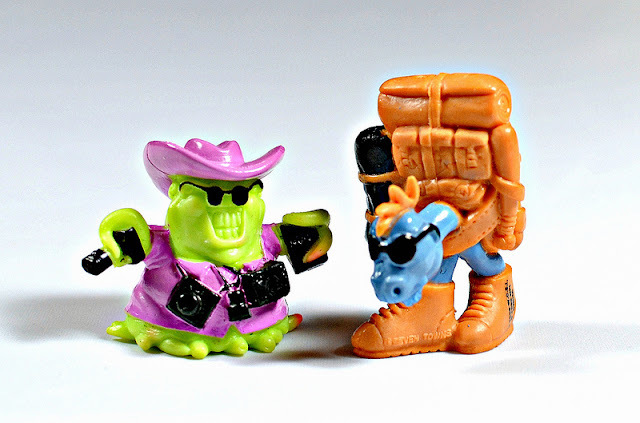 What: P.E.T., or "Pocketsize Extra Tiny" Aliens (there are a lot of acronyms in the world of mini figures, no? ), a set of wacky-looking soft plastic aliens with painted details. According to MinifiguresXD there are around 30 different figures, but I only have the two pictured above. Where: Apparently these were mostly a U.K. thing, and were offered as cereal premiums there, but I remember getting the two I have as kid's meals premiums at White Castle here in the U.S. I am not sure exactly how many were offered that way. Who: Created by Seven Towns. Like Monster Wrestlers, they started off as cereal gifts, but were soon given away with comics too and eventually could be bought in the shops. There's bigger ones available too, called "Commanders" with light-up bits and flashy noises - they came with their own flying saucer!